What do you buy for the person who has Everything? MEMORIES! Whether you are running out of time, can't sneak their slides, negatives, or videos out of their house, or you want them to be part of the experience, you can give them a gift card. Then, they can choose when they want to convert their film and videos, and they can choose exactly which ones, and you get to be the hero. Gift Certificates can be redeemed on any of our services. It's never too late for a Gift Certificate! 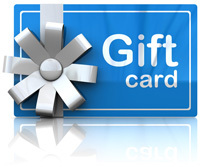 You can call or email us to request your gift card. We will run your credit card for the amount you choose. We will then email you a PDF that you can print out and put in a nice card for your loved one. When they want to redeem their gift card, they just need to fill out the order form like normal and then include their gift card when they send in their order. Local Customers: Feel free to come to our office during our regular office hours, and we will provide you with your gift card. You can create your gift card for any amount that you choose. When your loved one wants to redeem their gift card, they will want to bring it in with their items that will be converted.